I don’t quite understand this entirely, but it appears a company has set up a bunch of legos that can be imported as calendar entries in Google Calendar. Quite interesting! 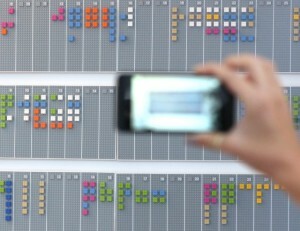 The system works by taking a picture with your smart phone, and then loading it into some software they custom coded that reads the grid and colors to create a calendar matrix. Then, they upload that to Google Calendar for you. The company has plans to make the code public. The software is custom code written using openFrameworks and openCV to read contours of the Legos. The code looks for the three long boards, for each month, and then splits the entire image into little blocks for each day. 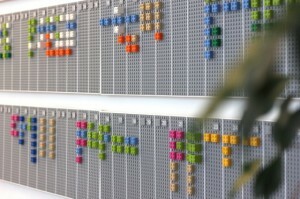 The actual calendar was designed to be as machine readable as possible (hence the wee white strips between each day). The software then uses a known pattern on the left side of each month row to calibrate for each colour, that was so they can get around different cameras, white balances and light conditions.